Several of the Petitioners come from the Oswestry area which meant that their local paper was also interested in the handover. On the day of the Mass Presentation this story appeared in the Border Counties Advertizer. 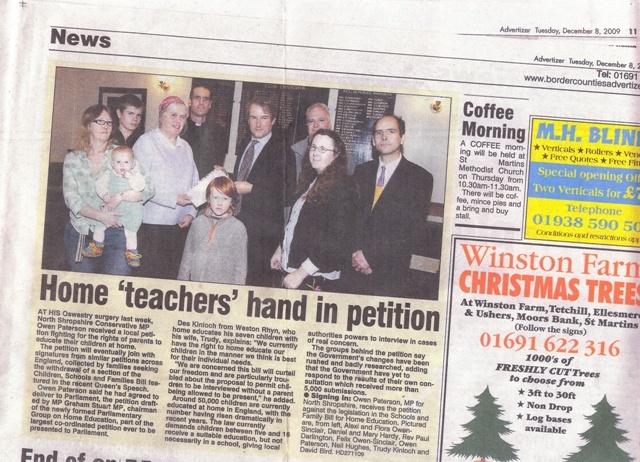 AT HIS Oswestry surgery last week, North Shropshire Conservative MP Owen Paterson received a local petition fighting for the rights of parents to educate their children at home. The petition will eventually loin with signatures from similar petitions across England, collected by families seeking the withdrawal of a section of the Children, Schools nd Families Bill featured In the recent Queen’s Speech. 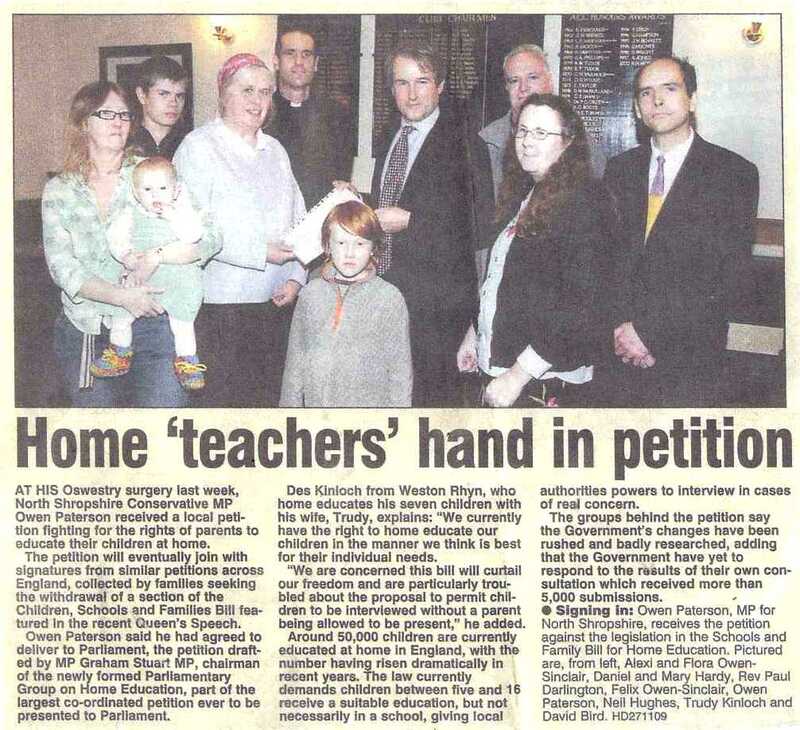 Owen Paterson said he had agreed to deliver to Parliament, the petition drafted by MP Graham Stuart MP, chairman of the newly formed Parliamentary Group on Home Education, part of the largest coordinated petition ever to be presented to Parliament. Des Klnloch from Weston Rhyn, who home educates his seven children with his wife, Trudy, explains: “We currently have the right to home educate our children in the manner we think Is best for their Individual needs. “We are concerned this bill will curtail our freedom and are particularly troubled about the proposal to permit children to be interviewed without a parent being allowed to be present,” he added. Around 50,000 children are currently educated at home In England, with the number having risen dramatically in recent years. The law currently demands children between five and 16 receive a suitable education, but not necessarily In a school, giving local authorities powers to Interview in cases of real concern. Signing in: Owen Paterson, MP for North Shropshire, receives the petition against the legislation in the Schools and Family Bill for Home Education. Pictured are, from left, Alexi and Flora OwenSinclair, Daniel and Mary Hardy, Rev Paul Darlington, Felix Owen-Sinclair, Owen Paterson, Neil Hughes, Trudy Kinloch and David Bird. Click image to view / download a scan of the article.